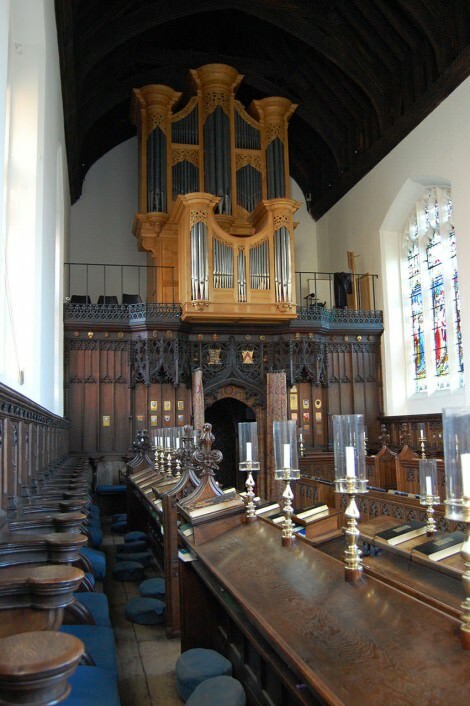 This organ is designed and built in the tradition of Father Smith, particularly the organs at Great St Mary Cambridge, St Mary Finedon and Adlington Hall. For the College the project was guided by the Stephen Farmer, then Precentor, and Richard Luckett, then Fellow and Pepys Librarian. The pitch is a¹=421Hz. The tuning is Kellner’s reconstruction of Bach’s tuning for his Well-tempered Clavier. The wind pressure is 2½ins (63mm) for the manuals and 71mm for the pedal.